Rising above the Valley of the Dark Lords, the Sith Academy is a monument to the power of the dark side and the might of the Sith Empire. Would-be students throughout Imperial space compete for the privilege of studying within the Academy halls, but only those strong in the Force are selected--and most of those perish in the struggle to become Sith. Beyond the training rooms lay many secrets that remain hidden to all but the most powerful Sith Lords. Higher levels contain chambers for members of the Dark Council, where few living creatures are permitted. Whispered rumors suggest that the Emperor himself has a sanctum within the Academy, but no one has seen the Emperor on Korriban for many years. Nowhere on Korriban is the planet's dark influence stronger than in the lower wilds. What begins as ringing ears and a cold unease can eventually cripple and dominate an unprepared Sith; weaker minds can be twisted and broken in a matter of hours, leaving soldiers weeping in the sand or slaves frothing, ready to kill. Before the Empire, before the Sith Order, Ajunta Pall was the very first Dark Lord. Once a Jedi Master, Ajunta Pall learned how to create and shape life itself through the Force--an art the Jedi feared and sought to end. In an act of defiance, he turned his newfound power against the Jedi Order and rebelled. In the end, the Jedi banished Ajunta Pall and his followers, exiling them to the Outer Rim--where the exiles found Korriban and a Force-wielding native species called the Sith. Ajunta Pall impressed the Sith with his power and technology, and the Sith soon revered the exiles as gods. From his seat of power on Korriban, Ajunta Pall was named Dark Lord of the Sith and founded the Sith Empire. Upon his death, Ajunta Pall's body was entombed in the Valley of the Dark Lords. After millennia of sandstorms, cave-ins and warfare, the tomb still stands as a testament to his lasting influence. Strength, power and strategy marked the rule of Marka Ragnos. Descended from the original Sith inhabitants of Korriban and the Dark Jedi exiles who interbred with them, Marka Ragnos was destined for greatness. He conquered his competitors in a series of quick, ruthless campaigns and became Dark Lord of all Sith, a title he would hold for more than a century. The reign of Marka Ragnos might have been short-lived had he not displayed great strategic discipline. Instead of clashing directly with Sith challengers who hungered for his power, he pitted his enemies against each other to weaken and destroy them. Similarly, he was one of few Sith of his era who knew of the existence of the Republic and the Jedi Order. He chose not to attack, and instead focused on strengthening the Sith Empire. The golden age of the Sith would end shortly after his death, but the legacy and spirit of Marka Ragnos would live on within his tomb in the Valley of the Dark Lords. Naga Sadow was ruled by ambition: ambition for power, for dominance and for the expansion of the Sith Empire. Marka Ragnos's body was still warm when Naga Sadow clashed with Sith Lord Ludo Kressh over their late ruler's title. The spirit of Marka Ragnos interrupted their duel and told the two Sith Lords of a greater enemy: the Republic and its Jedi defenders. Naga Sadow saw opportunity in this revelation and launched an attack on Republic space, a move that would see Sadow named the Empire's ruler and spark the Great Hyperspace War. Naga Sadow's ambition and overconfidence soon became his greatest weaknesses. Even with his mastery of Force illusions, the Republic outmatched the Sith. Sadow's invasion failed, and the Republic fleet pursued him back to Sith space. He fled Korriban with his warriors as the Sith Empire crumbled around him. Sadow sought refuge on the remote moon Yavin Four, where he died after spending years trying to rebuild the Empire he had inadvertently helped to destroy. Naga Sadow's spirit, however, survived to pass on Sith teachings, planting the seed of corruption among his Jedi enemies. Lord of Hate, Master of the Gathering Darkness and Dark Lord of the Sith. These are but a few of the titles worn by the great Tulak Hord. His command of the dark side and mastery of lightsaber techniques won Hord many battles, and each victory earned him enemies abroad and within the Sith ranks. Of the many who challenged his might, none were successful. Among Hord's greatest triumphs were the battles of Yn and Chabosh. With an army of dark side warriors and his faithful Dashade assassin at his side, he annihilated the rebels who defied the expansion of the Sith Empire and went on to conquer the Dromund system--setting the stage for Dromund Kaas to eventually become capital of the Empire. Imperial historians believe the worlds conquered by Hord number in the hundreds, but any records from his bygone era were lost in the Great Hyperspace War. Since the dawn of the Empire, the Valley of the Dark Lords has been the final resting place for the galaxy's most legendary Sith. Carved into the rock walls and anointed with the blood of a thousand slaves, the valley's tombs are monuments to the influence and strength of their interred lords. A tomb's construction can require decades, construction beginning long before death claims its eventual occupant and ending long after. With the defeat of the Sith Empire in the Great Hyperspace War, Korriban was abandoned with only ancient statues to guard over the valley. 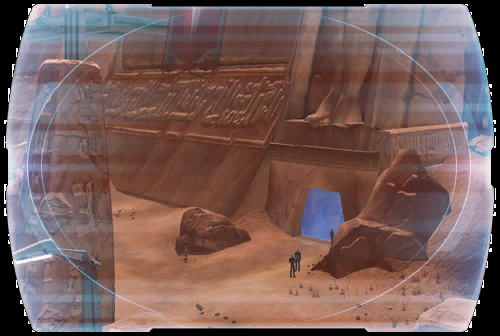 Grave robbers and cave-ins wore down the tombs for a thousand years until the Sith returned and restored Korriban to its former glory. Excavations into the rediscovered tombs are now underway, and already Sith wonder who will be the next great warrior to lie among the legends in the Valley of the Dark Lords.